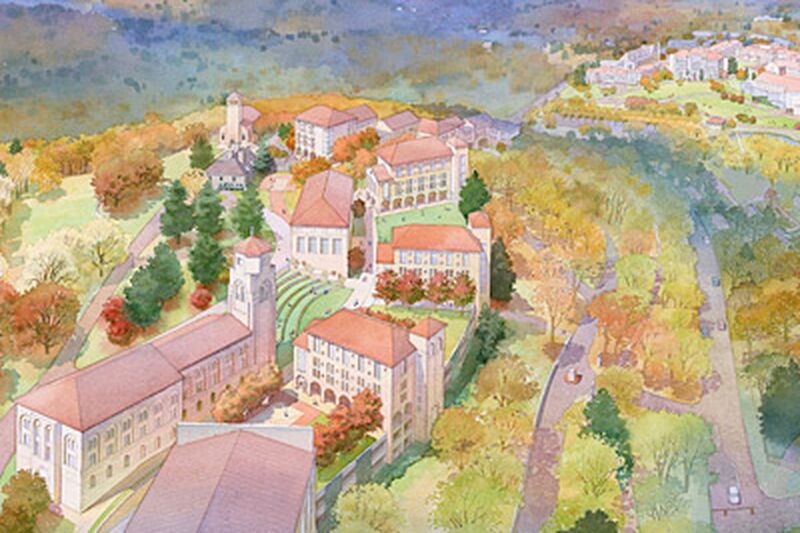 An artist's rendering of Chestnut Hill College's propsed expansion. "It is very much like the town of Le Puy, France, where the Sisters of St. Joseph were founded," she said, referring to the religious order that established the college in 1924. The plan, which will require a zoning change, is subject to City Council approval. The college publicly unveiled details to the community at a meeting last night and will discuss it again at 7:30 tonight at the Chestnut Hill Hospital auditorium, before the community's development-review committee. Vale said the plan, which also includes a student center, academic building, and underground parking facility on the main campus, was designed to keep the college prosperous in an increasingly competitive higher-education environment. The plan calls for a performing arts center, four new dormitories, several academic buildings, a chapel, and an underground parking garage with a green roof on the new property, formerly owned by Temple University. "We are being faithful to the tradition of the college, while at the same time stepping out in a new and bold direction," Vale said in an interview yesterday afternoon. "It's going to enhance the town of Chestnut Hill and hopefully bring renewed economic prosperity to the area and . . . be a benefit to the city." Every building on the new property except for a historic mansion where three presidents - John Kennedy, Lyndon Johnson, and Gerald Ford - once slept would be razed. Currently on the property, which is on the south side of Germantown Avenue, are a lodge used for student housing, a pool house, a small caretaker's residence, and a carriage house where some Sisters of St. Joseph live. The mansion, with a 160-seat dining area, is undergoing $6 million in renovations and will be preserved for a conference center and classrooms during the academic year. The plan could take 25 years or longer to complete. It will cost between $350 million and $500 million and largely need to be paid for through fund-raising and state and federal grants, Vale said. The school has begun the silent phase of a new capital campaign that will go public in 2011, she said. The college hopes to build the roads and underground parking structure on the new property within the next couple of years. That will cost about $22 million. Within five years, it hopes to erect the student center and underground parking complex on the main campus, she said. After that, the order of building will depend on need and the ability to raise funds, she said. Walter J. Sullivan, president of the Chestnut Hill Community Association, said he had not seen the plan but did not anticipate problems. "I am generally 100 percent in support of Chestnut Hill College, and of all that I know, there is a plan that will entail the significant expansion of the number of students they can take, and it will involve some substantial developments on their principal site and on the Sugarloaf site. "And I think that's great." The association's committees will assess whether there would be any adverse impact on neighbors. "I don't imagine that there are any," Sullivan said before last night's meeting. About 20 people attended the session, with several speaking beforehand in support of the college. But they questioned the impact on traffic and parking of adding 600 students to the campus. "Most are saying, 'Tell me a little bit more,' " said James Pope, a neighbor and chief financial officer at Germantown Friends School. "Find a way to make it happen with a light footprint on the community." Several residents at last night's meeting expressed concerns about dramatic change in the community's landscape, citing traffic, noise, and aesthetics. Among them was George Thomas, a neighbor and an urban-studies professor at the University of Pennsylvania. "All of us should be very leery," Thomas said. Vale said the college would leave 10 acres around the perimeter of the property untouched as green space. It also will not build on the steepest slope of the property, which will leave about 15 acres at the crown of the hill for development. "We're trying to respect the wishes of our Chestnut Hill neighbors, who were so supportive of us when we bought the property," she said. "They asked that we not build something that's so imposing that we would lose the wooded aspect of that part of the town." The college will seek to have the property rezoned from residential to an institutional development district, so that it does not have to seek approval for each new building. "It saves time and it saves money," Vale said. School officials are taking the plan before various planning committees to gain support for the overall vision. Peter Saylor, partner at SaylorGregg Architects, which is overseeing the project, cautioned that the buildings in the plan are "conceptual" at this point and have not been designed. "This is really an introduction," Saylor said of the meetings this week. Parking, which is tight in Chestnut Hill, would increase under the plan. The new site would grow from 150 to 600 spaces, while the main campus would add between 250 and 500 to its existing 500 spaces, Vale said. Despite an expected decline in high school graduates nationally, Vale said the college could attract the larger student body. The school admitted 700 more students for this academic year, which saw the eventual enrollment of 350 freshmen and transfer students - up 31 percent from the preceding year. She said 1,500 students still would be a small enough number to provide a nurturing environment, but would be more viable economically and marketing-wise. Tuition, fees, and room and board at the college this year total $35,550.